REFALO. On April 6, at John Radcliffe Hospital, Oxfordshire, England, to Santa née Bozule and Giancarlo, God’s precious gift of a daughter – PHILIPPA, a most welcome sister to Mia and Massimo. Deo gratias et Mariæ. TAGLIAFERRO. On April 6, JOSEPH, 85, of Paola, residing in Sydney, Australia, passed away peacefully comforted by the rites of Holy Church. Mourning him deeply are his wife Joy née Bugeja, his sons Victor and Paul, his grandchildren Tammy, Ricky, Emily and Brendan, his great-grandchildren Ayrton and Courtney, his sisters Emma and her husband John Pendlebery, Miriam and her husband George Cassar, Evelyn and her husband Joseph Caruana, his brother Edward and his wife Anita, nephews, nieces, other relatives and friends. The funeral Mass and internment was held in Sydney on Friday April 12. A celebration Mass for the repose of his soul will be held on Monday, April 15 at St Nicholas of Tolentino Church, Lampuka Street, Tarxien at 6pm. Lord, grant him eternal rest. DENZEY. On April 9, ELSA, aged 96, passed away in her residence in Toronto, Canada. In Malta, she leaves to mourn her great loss, her beloved and only remaining sister Terry née Bencini, her husband Maurice Lubrano, their children and grandchildren and all other relatives and friends. Elsa passed away in the comfort and love of her daughters Fiona, Nella and Nicki. Our deepest sympathies and Lord grant her eternal rest. ATTARD MONTALTO. In memory of RENO who left us six years ago. Loved so much, always missed and forever in our hearts. Nick, Lawrence, Bunty and all family members. CURMI – HILDA. So lovingly remembered today, as always, on the 61st anniversary of her death, who together with our late father Victor, raised a family of 13. Lord, grant them eternal rest. FENECH – Dr MASU FENECH, LL.D. In loving memory of a dear father. Always in our thoughts and prayers. Marlene, Maryrose, Frederick and grandchildren. GATT – VICTORIA, 14.04.16. In loving memory of a very dear mother, sister, aunt and friend on the fifth anniversary of her demise. Fondly remembered by her son Colin, family and friends. Always in our thoughts and prayers. Rest in peace. GATT – VICTORIA. Forever in our hearts aunty Vicky. What you meant to us can never be put into words. The beautiful moments of laughter and tears we shared I carry with me every day. Sorely missed, until we meet again. Angela and Daniel. GRECH. In loving memory of a dearest father and grandfather, CHARLES, today the anniversary of his passing on. Fondly remembered and greatly missed by Sylvana, Mariella and Wilfred, Diana, and Stephen, widower of Kathryn, and all his grandchildren. GULIA – WALTER. In loving memory of a dear brother especially today. Antoinette, John and Simone. HERRERA. Judge JOSEPH. Today 25 years from his demise. Best father and grandfather ever. Never forgotten. Always in our prayers. Consuelo, Justine, Alexander and Chiara. MALLIA. In loving memory of PETER on the third anniversary of his demise. Deeply missed by his wife Isabelle, his sister Nathalie, his brother Ernest, nephews, nieces and other relatives and friends. Lord, grant him eternal rest. PULLICINO. In fondest memory of a dear friend MOYRA on the 20th anniversary of her parting to eternal life. Marie. SULTANA – CONNIE. In loving memory of our dearest mother, today the first anniversary of her passing to eternal life. but having you as our mum was by far the greatest gift of all. Thinking of you so much always and wishing you were here. Remembering your lovely smile and love. David, Paul and Sue, Annemarie and grandchildren. Mass in her memory shall be offered at the Ursuline Creche on Monday, April 15 at 6pm. TALIANA. In loving memory of GAETANO, today the 21st anniversary of his death. Fondly remembered by his wife Lucy, children Odette and Phillip, Annadora and Lino, George and Mavis, Louise and Godfrey, Diane and James, and his grandchildren. Lord, grant him eternal rest. ZERAFA – DORIS. In loving memory of a beloved mother, grandmother and great-grandmother on the first anniversary of her demise. The next Malta Adlerian Psychology Association meeting will be held on Tuesday, April 23 at 6.30pm at Stella Maris College, Gzira, Lasallian Centre. Suzanne Mohnani will continue the discussion on stress and its impact on the well-being of our children and adolescents. 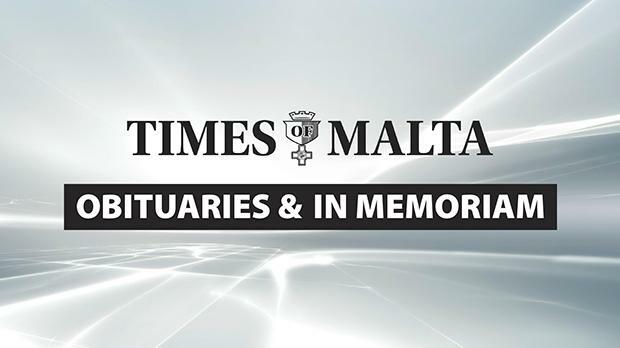 To book an obituary or an ‘In Memoriam’ email classified@timesofmalta.com or night@timesofmalta.com after office hours.